Refer to “cylinder head disassembly and assembly” . 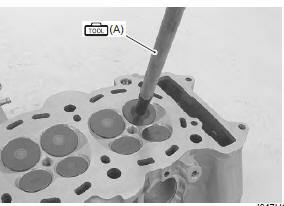 Check the gasket surface of the cylinder head for distortion. Use a straightedge and thickness gauge. Take clearance readings at several places. If readings exceed the service limit, replace the cylinder head. 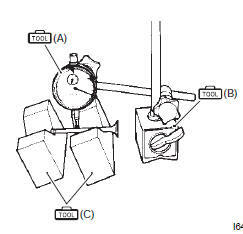 Support the valve using v-blocks, as shown in the figure, and check its runout using the dial gauge. If the runout exceeds the service limit, replace the valve. Place the dial gauge at a right angle to the valve head face and measure the valve head radial runout. If it measures more than the service limit, replace the valve. Visually inspect each valve stem and valve face for wear and pitting. If it is worn or damaged, replace the valve with a new one. Lift the valve about 10 mm (0.39 In) from the valve seat. Measure the valve stem deflection in two directions, “x” and “y”, perpendicular to each other. Position the dial gauge as shown. If the deflection exceeds the service limit, then determine whether the valve or the guide should be replaced with a new one. Measure the valve stem o.D. Using the micrometer. If it is out of specification, replace the valve with a new one. If the valve stem o.D. Is within specification but the valve stem deflection is not, replace the valve guide. After replacing the valve or valve guide, recheck the deflection. if valve guides have to be removed for replacement after inspecting related parts, carry out the steps shown in valve guide replacement. Refer to “valve guide replacement” . The force of the coil springs keep the valve seat tight. A weakened spring results in reduced engine power output and often accounts for the chattering noise coming from the valve mechanism. Check the valve springs for proper strength by measuring their free length and also by the force required to compress them. If the spring length is less than the service limit or if the force required to compress the spring does not fall within the specified range, replace both the inner and outer springs as a set. Visually check for valve seat width on each valve face. If the valve face has worn abnormally, replace the valve. Coat the valve seat with a red lead (prussian blue) and set the valve in place. do not use lapping compound. Rotate the valve with light pressure. Check that the transferred red lead (blue) on the valve face is uniform all around and in center of the valve face. If the seat width “a” measured exceeds the standard value, or seat width is not uniform reface the seat using the seat cutter. Refer to “valve seat repair” . Clean and assemble the cylinder head and valve components. Fill the intake and exhaust ports with gasoline to check for leaks. If any leaks occur, inspect the valve seat and face for burrs or other things that could prevent the valve from sealing. Refer to “valve seat repair” . extreme caution when handling gasoline.